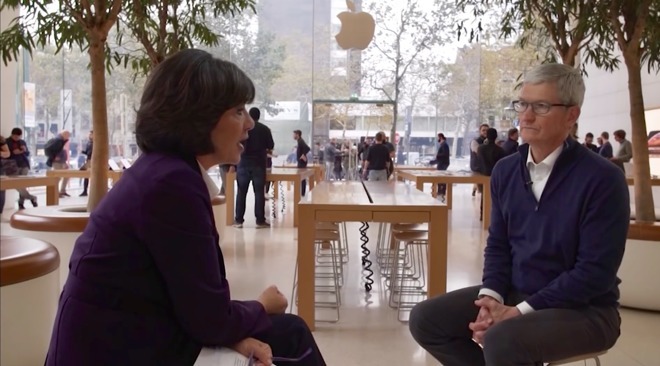 CNN this week shared what appears to be the remainder of its October interview between Apple CEO Tim Cook and Christiane Amanpour, with the executive touching on a myriad of topics ranging from coming out as gay to autonomous vehicles. Shared in a 10-minute clip posted to CNN's YouTube channel, the interview starts with Cook and Amanpour discussing why the Apple chief publicly came out as gay, a story he has recounted in the past. As in previous interviews, Cook restated his desire to help the children who would email him with their own heartfelt stories. The interview transitioned from Cook's intent to help kids to helping everyone, specifically minorities. He reiterated that everyone needs to be treated with respect. When asked about Steve Jobs and how the late tech guru's shadow informs his own personal legacy, Cook said, "I don't think about it. I just do stuff." Lastly, Cook dodged specific questions surrounding Apple's rumored autonomous vehicle project, and instead focused praise on the new Apple Park campus. He did get a bit more specific about Apple's intentions in the space, saying, "We are working on autonomy. Autonomous systems. On the software side to be very clear." The comments mirror previous statements from Cook suggesting Apple is not necessarily working on an autonomous vehicle. CNN aired the first portion of its interview with Cook in late October.